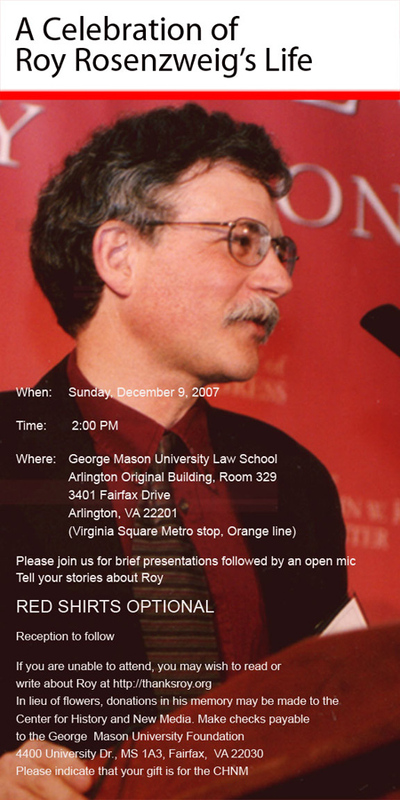 Readers of Found History and friends of CHNM will want to know that a celebration of Roy Rosenzweig’s life will be held at George Mason University in Arlington, Virginia on December 9, 2007. Please see the attached invitation for details. Directions to Mason’s Arlington campus can be found online. Additional information, along with a memory bank of photos and stories of Roy can be found at thanksroy.org.